Believe it or not, almost 99% people have come across video formats incompatible problems when replaying the downloaded or purchased videos/movies on videos players and mobile devices. Actually, different video formats consist of different video and video codecs so that they are only available in particular video players. Simply, if you desire to play HD MKV/AVCHD movies on iPhone 6 Plus, you should use video format converter to transcode MKV video file to be compatible with iPhone 6 Plus. Which is the Top Video Format Converter? With the widely usage of mobile devices, it is an urgent need for people to convert video formats. Some people may have tried several video converting tools, but, finally failed. In order to easily finish the task of converting video formats, here, MacX Video Converter Pro is highly recommended to all of you. 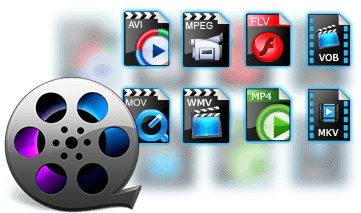 Built in 320+ video and audio codecs, it is capable of freely converting any video to over 180 video formats and 14 popular audio formats on macOS (macOS Mojave included) with intact quality and 5X faster speed, such as convert AVI to MP4, MKV to AVI, WMV to MOV, FLV to AVI, AVCHD to MOV, MKV to MP4, MP4 to MP3, etc. Now, follow the below steps to learn how to change a video format. Before converting full video, you are suggested to download video file format converter on your Mac. Then, we take "convert MKV to MP4" as an example. Step 1: Import MKV file. Free download video format converter for Mac, launch it and click "Add File" button to load the MKV files. 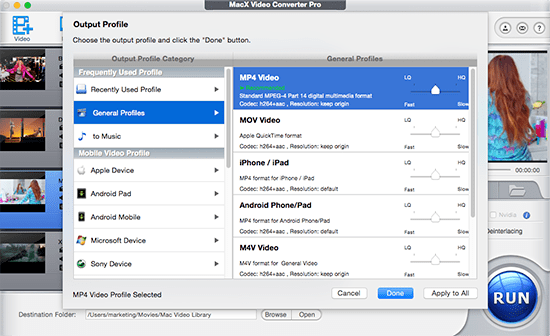 Select "MP4 video" as the output video in "Mac General Video" category. Warm note: this best video file converter allow users to adjust all the parameters of profile like resolution, frame rate, bit rate, sample rate, etc that would better fit your player or portable devices. Specify output folder on your computer to save the output files. Click the "Browse" button to choose the path where you want to save the output MP4 files in. Click the "RUN" button to start converting video to MP4 on your Mac computer, you could view the conversion progress and are able to stop the digital video converter to MP4 process at anytime. Nowadays, many people have requirements on editing video no matter for sharing with friends or surprising someone. But all editing tools have their own supported video formats as well as video players (QuickTime, VLC, etc). For example, the best video format for Final Cut Pro is MP4 or MOV; iMovie supported video formats include: MP4, MOV, AVCHD, DV&HDV; QuickTime supports many media formats: MOV, MP4, M4V, 3GPP, AVCHD, AVI and DV. Obviously, video files with .flv file extension should be changed to .mp4 with the aid of MacX Video Converter Pro if you want to edit or play FLV video. By the way, this video conversion software can also be made as video editor since it is able to clip video segment, crop frame size for removing the black bars, merge separate videos into a new one, and add watermark. It is true that more and more people would like to upload their self-made videos to YouTube/Facebook for sharing with others. Keep in mind: you'd better figure out whether your video file format is the best video format for YouTube/Facebook or not before uploading. If not, you need to use video format converter to convert video to AVI, FLV and more. Here, we list all suitable video formats for YouTube and Facebook uploading. YouTube supported video formats: MP4, FLV, AVI, MOV, 3GP, MKV, MPEG, WMV, and SWF. Supported video formats for Facebook: 3G2/3GP/3GPP, WMV/ASF, AVI, DAT, DIVX, DV, FLV, M2TS, MKV, MOD, MP4, M4V, MPEG, MTS, NSV, OGG, TOD, TS, and VOB. More and more people like watching HD movies/videos on mobile devices instead of on computer and TV because of convenience. As we know, lots of HD videos can't be directly play on phones or tablets, such as, AVCHD video, Blu-ray video, HDTV video, Matroska video and more. Thus, question is: how to convert HD video to iPad iPhone without sacrificing any video quality? Hopefully, with 420+ profiles infused, the above-mentioned video format transcoder has ability to directly convert HD video to iPad iPhone Android devices like iPhone, iPad Pro, iPad Air 2, iPad Mini 4, Apple TV 4K, iTunes, iMovies, Samsung Galaxy S9/Note 9, and more.